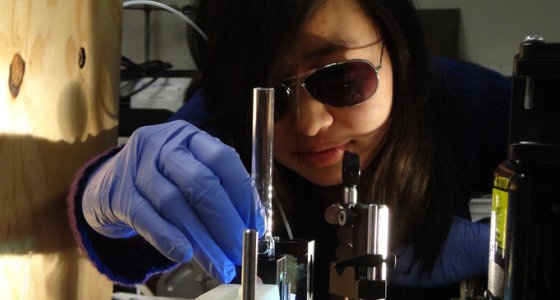 Outstanding research, on topics ranging from an ultrasound-based drug delivery to the true meaning of poetry in the lives of youths, will be honored at the 33rd Annual SJSU Student Research Forum noon April 4 in Engineering 285-287. The SJSU Office of Graduate Studies and Research and the SJSU Research Foundation will jointly sponsor the event, which features student poster presentations, an awards ceremony, and reception. These 2012 SJSU Student Research Competition winners will go on to present their work at the CSU Student Research Competition May 4 and 5 at California State University, Long Beach. Cash awards will be provided to the outstanding presenter and the runner-up in both the undergraduate and graduate divisions of each category. Here’s more on the SJSU students and their faculty mentors. Description: We have developed hybrid P450 enzymes as biocatalysts for the selective hydroxylation of lauric acid. These enzymes can be valuable for biotechnological applications. Description: An avoidance assay coupled with genetic techniques suggests a unique signal transduction pathway and an unexpected mode of synaptic transmission in Caenorhabditis elegans sensory neurons. Description: Spectroscopic data of hydrocarbons diluted in nitrogen was recorded over a thermal range for comparison to the observed spectrum of Triton, a moon of Neptune. Description: We are developing an ultrasound-based drug delivery scheme using microcapsules. These are designed to be acoustically sensitive by encapsulating ultrasound contrast agents and drugs. We study their structural changes and imaging signatures under ultrasound. Description: This essay investigates the relationship of home and church in three novels by the American writer Willa Cather (1873-1947). The novels are O Pioneers!, My Ántonia, and Death Comes for the Archbishop. Description: This project centers on an illusionistic frescoed room displaying eight ideal portraits of women at a time when poets like Firenzuola were assembling an ideal through literature. Description: She investigated the true meaning of poetry in the lives of youths and the activism that merged from it.